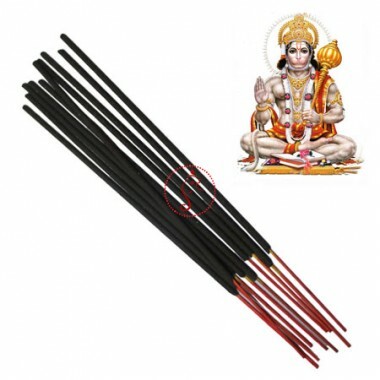 Lord Hanuman incense stick Blesses with high level of awareness, divine consciousness, wisdom, right judgment, control over all senses, powerful vocabulary, adventurous life, fearlessness and success. There is a spiritual reason behind lighting incense sticks. It is so believed that the rings of smoke that rise high into the air carry our prayers to the gods. It inspires your thoughts to be pure and beautiful. The incense stick burns itself completely filling the air with a fine smell, leaving behind just the ashes. This is one of the Hindu rituals which again symbolises a human virtue or quality. It teaches man the art of sacrificing oneself for the cause of others. It shows how to light the life of other people with happiness, leaving behind your own desires and aspirations. This is the reason as to why we light an incense in a puja or a religious ceremony. Incense sticks are also used during several therapies. The aroma that is spread in the air after you light an incense stick has an immense healing and soothing effect on the mind. You become mentally relaxed and forget all other troubles and worries when you sit for a religious ceremony. This helps you concentrate and pray to the lord with all your heart and soul. When you offer a prayer with great devotion it acts like a meditative process that reduces stress and depression.